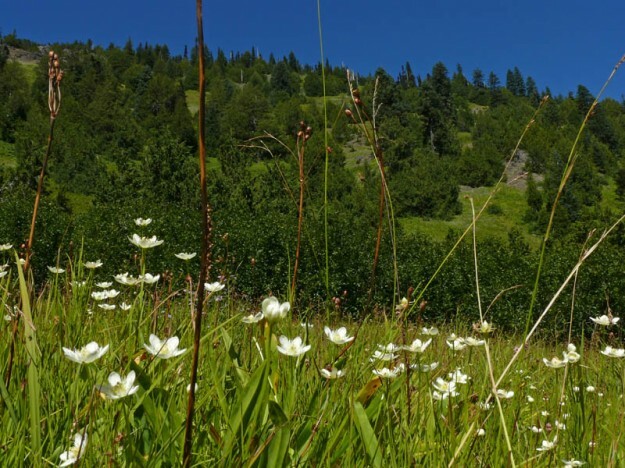 Labor Day Monday (September 6) was a working day for me—if spending the day botanizing in a pretty wetland can ever be called “work.” After studying the Mimulus primuloides at Hills Peak (see Pikas, and a Coyote, and Monkeyflowers, Oh My! ), I wanted to see some more populations in a different area of the Western Cascades. So I headed north to Echo Basin. I knew there’d be other late-blooming wetland plants as well. The air was very crisp when I arrived at the trailhead—a bittersweet reminder that autumn is just around the corner, and pretty soon I’ll be saying goodbye to the mountains until next spring. One of the first plants I noticed along the trail was blunt-sepaled starwort (Stellaria obtusa), one the inconspicuous plants whose distribution I’ve been trying to fill out. 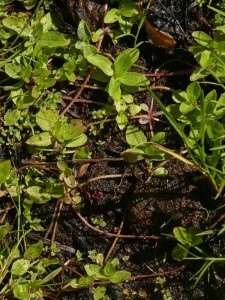 There were large, prostrate mats of it along much of the trail. I tediously checked many of them with my hand lens to make sure they really were S. obtusa, looking for four blunt sepals, round capsules, and hairs along the edges of the leaves. Only one fooled me by being the more well known look-alike, Stellaria crispa, with 5 sharp sepals and long capsules. Most of the ones I’ve seen haven’t formed quite such flat mats. I wish the plants would stop trying to trick me! 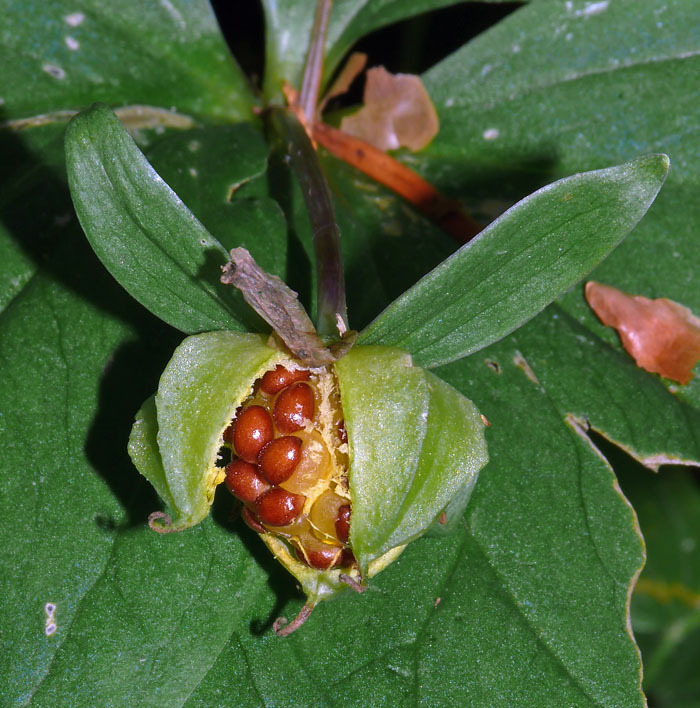 Trillium ovatum’s seeds carry with them a fleshy appendage called an elaiosome that ants find tasty and drag back to their nest effectively dispersing the seeds. Another tiresome task I took on for the day (all right, maybe some of this really was work!) was flipping over leaves of dwarf bramble (Rubus lasiococcus), looking for berries (technically these are actually aggregates of drupelets) hiding below. Even mats stretching 10′ had less than a dozen fruits, most of which weren’t quite ripe. Another of the botanical puzzles I’m trying to solve is why the berries I’ve found in the last couple of years (I never thought to look before) don’t match the published descriptions. A run through all the major flora turned up only one reference that didn’t state that the fruits are red. Abrams’ old Illustrated Flora of the Pacific Northwest says they are “greenish or rose-colored.” A flip through some of my many photo plant guides turned up a reference to hairy fruit with no mention of color in Wildflowers of the Western Cascades, but every other book claims they are red. I still haven’t found a red fruit, and, in fact, the few ripe ones I’ve found are white: greenish to bright white when unripe and dull white when ripe. I’m sure they are red somewhere, although I haven’t found a single photo to confirm this. My question is, what is the extent of the white-fruited plants? My first white fruits were seen in the Calapooya Mountains (see Some Oddities at Skipper Lakes). Is this a very localized trait? One that spans the whole of the Western Casacades? All of Oregon? I can be stubborn when I want to figure something out, so I’m determined to check out as many populations as I can of this ubiquitous but unassuming mountain plant. It wasn’t until I’d flipped over many, many leaves, and found a dozen or more white but unripe fruit that I finally found one fruit that was perfectly soft and ripe—and dull white—that I felt satisfied that, yes, this trait isn’t just evident in the odd transitional zone of the Calapooyas. I’ll keep looking now that they are ripening. Hopefully my knees will survive all the squatting down this is going to require. These Mimulus primuloides clearly spread vigorously by long stolons. This is not so evident in some other populations. Out in the open wetland, it was much warmer, and the sun felt good. It wasn’t enough to bring out more than a couple of old fritillaries, however. As I had hoped, the Parnassia cirrata was in full bloom. Some Aconitum columbianum, Stachys cooleyae, Angelica genuflexa, and beautiful scarlet Castilleja suksdorfii were still flowering as well. Most fortuitously, there were still some of the little yellow flowers of Mimulus primuloides lingering in open spots between the taller foliage. These were a little different than either of the forms I saw at Hills Peak. The flowers were intermediate in size, and the leaves were small but only a few showed any hairs. So they had a different combination of traits than the Hills Peak or Warfield Bog plants I’d checked out last month, but they were still fairly uniform across this population. They were clearly sending off numerous strawberry-like stolons. Perhaps there is very little genetic diversity with all that running around. It is certainly a quicker and more efficient method of reproduction than setting seed. Lots of aquatic plants inhabit the main pond in one of the Ikenick Creek wetlands. The Echo Basin trail is quite short, so there was plenty of time for more exploring before I had to head home. Less than a mile off of Hwy. 126 is a relatively low-elevation wetland complex I discovered a couple of years ago along Ikenick Creek. 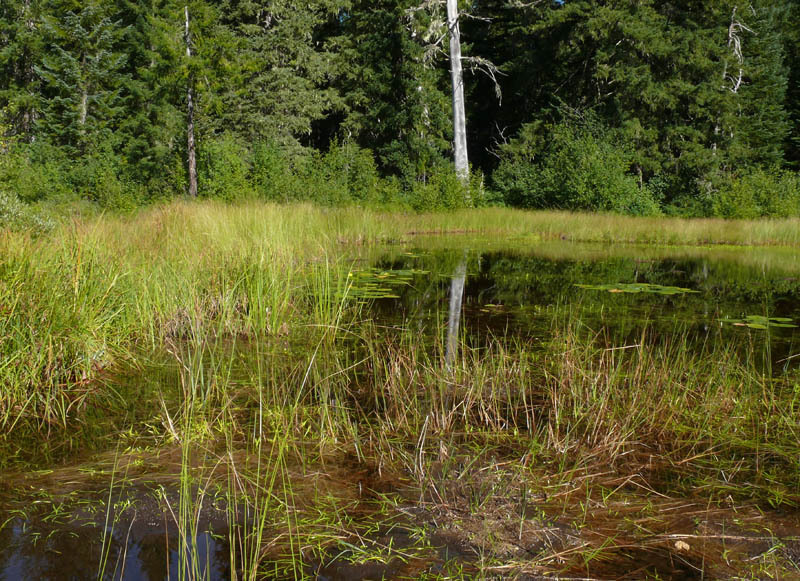 There are actually four wetlands arranged in a rectangle, separated by short stretches of woods. I’ve checked them all out, but the one closest to the road is the most interesting. Small ponds and narrow channels through this wetland are home to a number of interesting aquatics. I wanted to see how they were doing, so I spent a couple of hours cruising around the wetland. That makes it sound like walking around in there is easy—it’s not. The channels are treacherous and much of the area is quite wet, even in September. I still haven’t gotten there early in the year to see the spring flowering, but I imagine much of it might be prohibitively wet that time of year. The first time I went there, I was surprised to find a number of colored ribbons and paths cut through the willows and other shrubs. Some of the ribbons are marked with “IBP Biological Study.” I discovered this stands for International Biological Program. Apparently they are doing some bird-banding there. I also found out from Ruby Seitz, one of the McKenzie District Forest Service biologists, that it is called the Smith Ridge Special Wildlife Habitat Area, and she sent me a copy of the survey and management plan. I’m glad to know it is being looked after. 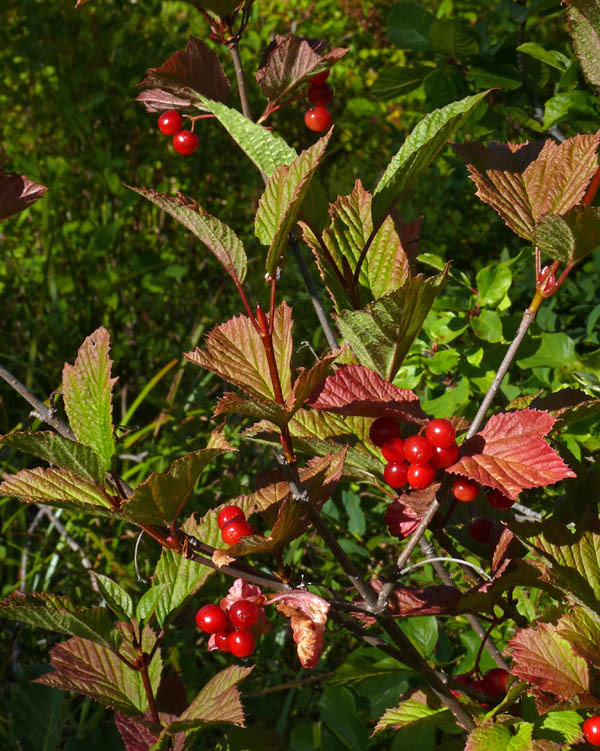 Highbush cranberry (Viburnum edule) gets its name from the gorgeous red berries that are clustered in the leaf axils. Over at the main pond, there were several yellow flowers on the pondlilies (Nuphar polysepala) along with some lingering flowers on the smallest species of bur-reed, Sparganium natans. It is apparently uncommon, but I’ve seen it in a few other wetlands in that area of Linn County. 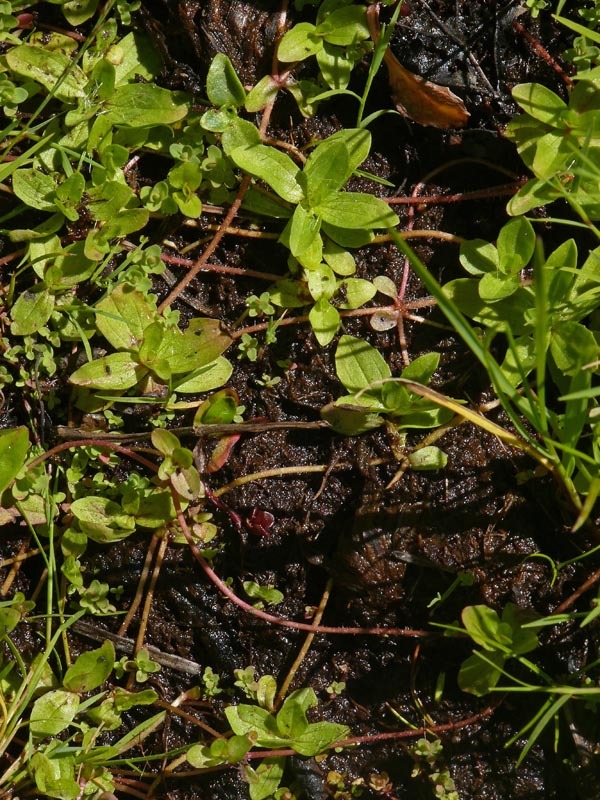 I found both bladderworts I’d seen here before, the tiny Utricularia minor and much larger Utricularia macrorhiza. No sign of flowers, however. There were many scraggly shrubs of Viburnum edule in the thickets. They were beginning to shift into their fall coloring, a beautiful shade of wine-red. Their glossy red berries were ripening, making them even more noticeable now after being virtually invisible much of the year among the tangled clumps of shrubs that grow on slightly higher ground. Between the golden shades of grasses and sedges, the reds of viburnums, dusty purples of bog huckleberries, and yellows of many other leaves, bogs are one of the most colorful areas to visit in the fall. It’s worth a trip to go see one, just remember to bring the rubber boots!